The currently sold board has the following text on top: Orange Pi 3 v1.5. USB, Ethernet, WiFi, Bluetooth, HDMI, DVFS and thermal regulation works on mainline linux with some trivial out-of-tree patches. 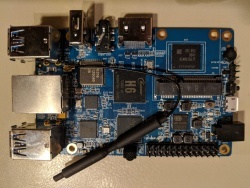 Direct support for this board is not yet in the mainline U-Boot, but it is possible to use U-Boot built for Orange Pi One Plus combined with ATF built with PLAT=sun50i_h6. The tree contains support for USB ports, Ethernet, WiFi, Bluetooth, RTC, HDMI, DVFS and thermal regulation. USB power rails are directly connected to the 5V input power, including on the micro USB connector (you'll have trouble powering the board from the DC jack, and using the microUSB port to connect the board to a PC at the same time). OTOH, the board can probably be powered from a USB 3 port via microUSB (untested). The schematic specifies a total current limit of 1.5A per the double USB 3.0 connector. The schematic shows optional polyfuse circuit to limit the USB current, but there's no polyfuse on the v1.5 of the board. If you try this, beware of the direct conenction between microUSB VBUS and DCIN. Like with other Orange Pi boards, UART uses 3.3V signalling and is 5V tolerant so you can use any of the usual USB-UART dongles. UART pin header is easily accessible. UART is located between the mic and the power on key. Pin order: GND-RX-TX. GND is marked by a white arrow. This page was last modified on 12 April 2019, at 13:36.